Calgary’s Prime Time Big Band is one of Canada’s premier large jazz ensembles. The group, conceived of and led by former Canadian Armed Forces (PPCLI) Band Director and Trumpeter Dave Jones, consists of Director and 19 musicians (five trumpets, four trombones, five saxophones, four rhythm players and a vocalist). 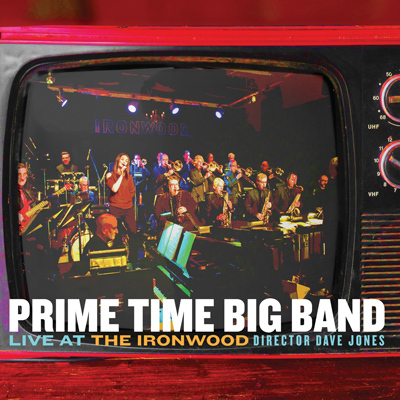 Prime Time performs music in the contemporary and classic big band tradition. Their debut recording ‘For Our Friends’ was released in 2004, and was recorded at the Banff Centre for the Arts. Known as an ensemble that features some of Alberta’s top jazz musicians, they are one of the busiest working big bands in Canada. On top of playing numerous concerts, festivals, and private events throughout the year, they have been performing a regular concert series at Calgary’s Ironwood Stage & Grill for the past 15 years. Every second Saturday afternoon from September to June, they perform to sold-out crowds for their jazz brunch. Performing approximately 20 of these concerts a season with new material each show and a weekly rehearsal, the band has matured and developed into a very tight ensemble with a defined musical voice.